How Many Miles To Babylon? adapted from the best selling novel by celebrated Irish writer Jennifer Johnston has been superbly presented at the Lyric Theatre in Belfast to mark the centenary anniversary of the First World War. Alec and Jerry as youngsters form a bond deeper than the expectations of their social classes. Adaptor Alan Stanford described Johnston’s tale set in 1914 as “the perfect novella”. This two-act tragedy of two young men from different social classes in Ireland could as he said have been a focus on the utility of war or even the “hideous carnage” but instead he chose to focus on the theme of their unique friendship in the midst of the chaos and contradiction of a war he says was not “Great”, but a misnomer. The two main characters of Alec Moore and Jerry Crowe share a Platonic closeness as they enter their teenage years despite the tensions of class prevalent in that era in Ireland where Alec’s parents showed their opposition to him mixing with lower class Jerry. The two develop a bond a joy of horses and eventually sign up to fight in the war… Alec to escape his oppressive, emotionally cold mother and father, and Jerry to pursue his excitement with life and further his republican ideals. These two characters played by Anthony Delaney and Ryan McParland gelled well together demonstrating the barriers of class to their deep friendship. Ryan particularly added a comic dimension to some scenes by his lightheartedness contrasting with the seriousness of his social surroundings in a class-torn rural Ireland and subsequently in the trenches. But the start of the play with Alec writing at his small table amidst the boom of cannon fire from the front line with excellent use of lighting immediately grabs the audience and draws them into the unfolding drama. The set by Philip Goss and the scenic artistry by Chris Hunter and Michael Shephard certainly added a very valuable dimension to the performance. The clever use of the revolving stage to move between scenes was technically well done and certainly challenging for the production team. Interestingly, it is Alec Moore who acts as narrator who breaks into conversation with the characters providing the glue that makes this adaption work brilliantly giving it excellent flow and clarity. A parallel plot in the drama mirroring the ‘Great War’ is that of Alec’s parents who seem locked in a battle of trivial ideals with very significant and tragic consequences. His mother seems to think that the chivalric ideal of him fighting as his duty, and even possibly dying, is a noble act, one he must pursue, an act fitting of his class. This high ideal contracts well with the more brawling physical style of Jerry, who is involved in the republican movement in Ireland gathering momentum prior to the 1916 uprising. Jerry himself says he is happy to serve along with the other 200,000 Irishmen, as when he returns after the war he will be a valuable military asset to his cause. 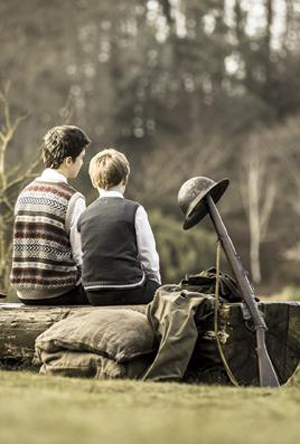 But as the war rages in its early days in Flanders and the two are faced with the rigours of a brutal military regime within the British Expeditionary Force, the plot unfolds and there is certainly a sting in the tail that heightens the tragedy of their fateful friendship. When a play grips you and you still feel deeply for the characters when you are walking out the front door of the theatre, you know it is a great play. How Many Miles To Babylon? had that effect on me. The standing ovation the cast received from the audience was very well deserved and this is a fine performance by all the cast that many will remember for years to come.